I just spent 4 days in this wonderful city and I wanted to share with you the best views I’ve encountered. Definitely one of the best views of the Fori Imperiali in Rome. It is located right at Via del Campidoglio and next to Piazza del Campidoglio, where the famous statue of Romulus, Remus and the she wolf is. Obviously the Vatican is one of the main attractions in Rome, so if you are planning on visiting you should make sure to climb to the top of the Basilica to get a panoramic view of the city. The price is a little high- 16€ to get into the Vatican and Basilica plus another 8€ to reach the top- but the view is easily worth the price. Yet another free view atop one of Rome’s hills, but this one will give you a perspective from the opposite side of the Tiber compared to the Giancolo. You won’t be able to see the Coliseum or Forum from this hill, but you will get a great view of the Northern part of the city. Right in the heart of Rome is the Piazza Venezia, and perched on the Capitoline Hill is the extravagant Tomb of the Unknown Soldier. Just as you can see this building from nearly any point in the city, going to the top allows you to get an equally clear view. Although it costs 7, the fact that you are in the heart of the city and able to look out over all sides makes the price well worth it. Although not one of the original seven hills of Rome since it lies outside the limits of the ancient city, the Giancolo hill provides one of the best views of the Rome today. 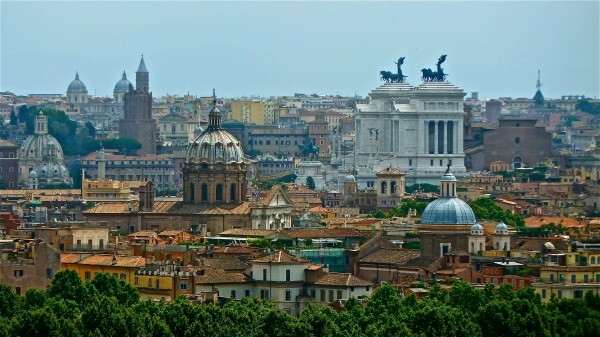 It is just a short walk West from the Tiber island and gives a breathtaking view of the city. Included with your Colosseum tickets you also have access to the famous Palatino. There you can enjoy amazing the amazing views it offers and have a really good time exploring one of the most ancient parts of the city and also the centermost of the Seven Hills of Rome. While this point will not give you a good view of the city, it will give you a spectrally sight straight out of a movie. By peeking through the keyhole of a large door, you are able to see a row of trees running to the edge of a hill that perfectly outline the dome of St. Peters Basilica. Even though you only get this one sight, the serene setting will imprint the view into your memory. Thanks for the comment Marc :)!